• Meet together in Pilgrim fellowship with Isaac Allerton descendants or those interested in the Isaac Allerton family. A general meeting of members will be held in Plymouth, Massachusetts every three years to coincide with the Mayflower Congress. 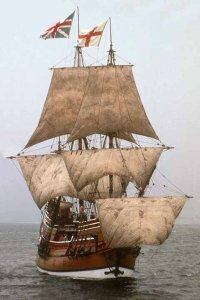 • Perpetuate and honor the memory of Mayflower passenger and Mayflower Compact signer, Isaac Allerton and that of his family; his wives Mary (Norris) Allerton and Fear (Brewster) Allerton; and their children, Bartholomew, Remember, Mary, Sarah and Isaac Allerton. • Encourage continued research into the origins of Isaac Allerton and Mary (Norris) Allerton in England. • Encourage continued research into the descendants of Isaac Allerton and to encourage research to discover descendants of his son, Bartholomew Allerton. • Assist descendants of Isaac Allerton in acquiring acceptable proof of eligibility for membership in the Society.